The phrase “ignorance is bliss” may be true in situations where you “forget” to check how many calories are in the piece of cake you had for dessert one night, however many people would agree that the phrase does not apply when it comes to checking the ingredients and chemicals that go into the products you and your family consume on a daily basis. Often times, people find themselves worn out after their busy days and reach for the quick and easy dinner options rather than spending time to prepare a fresh meal. What these people most likely do not know is that these quick and easy dinners are often filled with chemicals and toxins that could potentially be harmful to those consuming them. 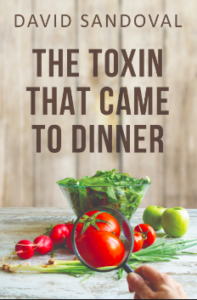 In the book “The Toxin That Came to Dinner” David Sandoval, founder of the company Purium Health Products, discusses the dangers of a toxin called glyphosate and the possible impact it may be having on your body- even if you choose to eat organic and non-GMO verified foods! bacteria, which also damages DNA and causes mutations that could lead to cancer or autism. The World Health Organization has declared glyphosate as a human health hazard, yet the chemical is still found on farms, playgrounds and dog parks and is continuing to cause massive health issues that could otherwise be avoided. According to Autism Speaks, autism spectrum disorder is a developmental disorder which “refers to a broad range of conditions characterized by challenges with social skills, repetitive behaviors, speech and nonverbal communication”. As of March 2019, the Centers for Disease Control (CDC) claims 1 in 59 children are affected by autism. As researchers have found correlations with a rise in autoimmune diseases and health deficits and glyphosate over the past 20 years, the AutismSociety also noted that autism in children increased 119.4% between the years 2000-2010. The chance of having an autistic child in 2000 was 1 in 150. In 2010 that number decreased to 1 in 68, and stated above, the number is now 1 in 59. This proves that autism is one of the fastest-growing developmental disabilities. Of course, autism is not a disability to be ashamed or embarrassed about, however if researchers have found a contributing factor to something that affects more than 3.5 million Americans, wouldn’t it make sense to try to prevent it? Based on these statistics, Dr. Stephanie Seneff of MIT predicts that nearly half the children born in 2025 will be diagnosed with a form of autism. Seneff explains that 10% of corn crops were exposed to Roundup in 2001. Children who were in utero during that time are part of the 1 in 68 children who have autism. Now, nearly 90% of corn crops are exposed to Roundup, which leads Seneff and other concerned parents to believe the presence of autism will only continue to rise due to the lack of research being done by the government to put an end to the toxin. Of course, being selective in purchasing only certified organic foods from trusted farms and stores is a good place to start. But since that is not easy and the glyphosate in our system does not leave our gut microbiome easily, David Sandoval advises we add a powerful Purium supplement to our diets, called BioMedic, which was specifically designed to help our bodies clean out the glyphosate and restore our gut to good health. It is the mission of Purium to provide the highest quality food products that restore vitality to our bodies. Order Biomedic online, using our gift code “FreshLocal” to save $50 on your first order. Request a free download of this book, “The Toxin that Came to Dinner”, by David Sandoval.